December 7, 2011—About 60 years ago (maybe a little more), I made my first trip to Florida. At the age of 5 or 6, I don’t remember a lot about that trip; I only have snippets of memories. We had driven all the way down to Miami Beach and had swum in the ocean. I remember seeing alligators and buying souvenirs. One of the souvenirs was a coconut shell carved to look like a monkey’s face, and it apparently was my brother’s. I remember this because I asked my mother, “Please give me Johnny’s head.” Mom was startled; she took my request literally for a few moments before she realized I wanted to see the coconut head. 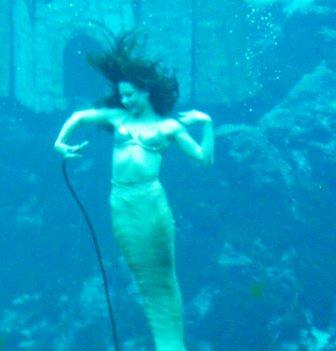 Another vague memory is visiting Weeki Wachee Springs and seeing the mermaids perform underwater. The mermaid show was “the” entertainment in Florida in those days, long before Mickey Mouse moved to Orlando. (I don’t think he had even taken up residence in California yet.) It was opened in 1947 with a small underwater seating area. After a few years, the seating area, which is 16 feet below the surface of the springs, was enlarged to hold 500 people. I imagine when my family visited the springs back in 1950 or 1951, it was quite crowded—a real tourist attraction. We went back to Weeki Wachee Springs today. Crowds were not a problem. There were perhaps two dozen people at the mermaid show, and the same number who took the 25-minute boat ride on the Weeki Wachee River, a seven-mile long river of crystal clear water that is 97% pure. A few years ago, Weeki Wachee went bankrupt, and the state took over the park. Visitors pay a relatively modest fee ($13 for an adult). The fee gives you access to a reptile show (educational), a boat ride, two mermaid shows, and a water park. The water slide did not look to be in commission today, and no one was swimming either. Of course, today was a rather ugly day here. It started out partly cloudy, and reached a high of about 75 degrees around noon. Then a front came in; the temperature dropped; and it started raining by the time we left the park around 2:30 p.m. On a hot summer day, the water would have been appealing, with its cool 72 degrees and its clarity, but not today. Jim, who is “almost” a native of Florida, since he has lived here for so many years, had never been to Weeki Wachee, so the mermaids were a first for him. We watched their second show (they perform three times a day), but didn’t stay for the third. They were nice to see, but not nice enough to wait an hour with nothing else to do at the park, since we had already been on the boat ride and seen the snakes. I didn’t swim with the manatees today, nor did we see any on the boat tour, but the day was fun, despite the weather. Because we had a late breakfast and skipped lunch, we are now going to participate in another of retirement Florida’s traditions—an early bird dinner. Tomorrow it is on to Fort Meyers/Sanibel Island, where we’ll go shelling and who knows what else?